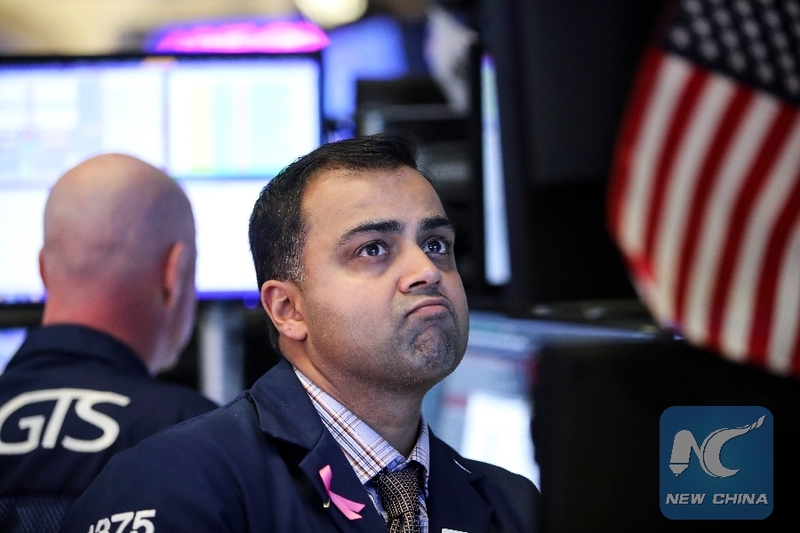 NEW YORK, Feb. 7 (Xinhua) -- The U.S. financial market is likely to remain in good shape this year with major existing catalysts, yet concerns in certain sectors would weigh down the overall economic growth rates, investment bankers said in their outlook for 2019. Main thrusters have appeared in U.S. banking industry, with expectations on future interest rate moves by the U.S. Federal Reserve, according to analysts of Keefe, Bruyette & Woods (KBW), a New York-based investment banking firm. However, high corporate debt levels and a lack of wage growth remain as primary concerns for the year, the analysts pointed out during a panel discussion on Wednesday. "The American banking industry is in terrific shape," said Tom Michaud, president and CEO of KBW. "It has the highest capital position that it's had in 80 years. Credit costs are very close to zero. So the industry is very profitable, very well capitalized and we think it's in a very good shape." Capital position is normally used to review a company's strategic and financial situation. Michaud believed that a strong U.S. banking industry has been benefiting from the country's tax reform since 2018, which has largely reduced the burden of corporate tax, as well as from de-regulatory moves for smaller banks, which have invigorated their growing dynamics. "We had tax reform, which was very beneficial to bank profitability," he said, "We've had some regulatory recalibration ... There will still be more, but there's a very good chance that the bulk of it has already happened, especially a Dodd-Frank banking reform bill that was passed last year." With the reform bill, the U.S. banking system removed a regulatory level, or federal oversight, that started with banks with 50 billion U.S. dollars in assets. The threshold of a systemically important financial institution for oversight was moved to 250 billion dollars. Small banks with between 50 billion to 250 billion dollars in assets in the United states also received a relief from easing lending, capital and trading rules due to the bill. The Dodd-Frank Act, originally passed after the 2008 financial crisis, was "some heavy medicine for the industry and the size of the legislation was enormous," said Michaud. He believed the reform bill of the Dodd-Frank Act has been "very good for the economy" and been done "in a very prudent manner that it hasn't increased riskiness." In this regard, Frederick Cannon, executive vice president of KBW, noted that a lighter regulatory touch and strong balance sheets of most U.S. financial firms, based on his research, should "enable companies to maintain reasonable growth through positive operating leverage and capital management." Another "catalyst" for 2019 is that KBW expects the Fed to raise interest rates two more times this year, moving the federal funds rate to nearly 3 percent, but then stop as a result of a slowing economy with a few signs of inflation. The U.S. central bank decided to maintain the target range for the federal funds rate at 2.25 to 2.5 percent and pledged patience in future policy making on interest rate adjustments on Jan. 30. The move has signaled more caution on the Fed's outlook, due to muted inflation pressures and global economic and financial developments. "The Fed ending its rate increases should allow commercial real estate values to stabilize and commercial loan defaults to be limited," Cannon said. KBW expected the U.S. housing market also to be affected by the Fed, as it is closely linked to mortgage loans and has been overheated. The company found relatively soft markets in traditional growth areas of the housing market in the northeast of the country, including the city of Seattle and in many parts of California. "Because those traditional growth areas are slowing down, housing markets could spill over into the broader economy," Cannon said. "The base case is for commercial real estate (CRE) values to stabilize in 2019. However, if the Fed raises interest rates more than expected and demand slackens, then CRE values could fall, putting loans at risk." KBW expected that the U.S. economy should continue to grow, but at slower rates with little inflation evident, which has posed a significant risk for growth. "The biggest risk is the lack of wage growth and income disparity within the United States, which reduced aggregate demand to keep the economy going," Cannon said, adding that a lack of aggregate demand at some point would cause the economy to run out of steam. "You have an economy in full employment with no inflation and very little wage pressures. That's not healthy. That is underscored by the income disparity that we've seen in the United States," he noted. Another concern lies on the corporate side, as U.S. corporate debt levels have risen to a significant high and "well past what they were prior to the financial crisis," according to Cannon. "So I think that's an area of some concern. Most of that debt, the high-leveraged debt, is not suggesting on the balance sheet," he said, pointing out that a lot of the debts have been "securitized" into fairly risky investment, such as exchange-traded funds and bank loan funds.